This wooden greenhouse is ideal for smaller gardens, providing a great growing area for flowers, plants and veggies throughout the year! This 4ft x 6ft Waltons Evesham Wooden Greenhouse is manufactured using strong, planed FSC sourced wood, and is clad using interlocking 12mm tongue and groove timber. Glazed with 2.5mm shatterproof styrene allows natural light to filter in and features an opening roof window to provide the perfect growing environment for plants and produce. The styrene is UV treated to protect the panels from discolouring and cracking and protects plants against harmful rays. A single half glazed door is supplied with a butterfly catch to keep secure. The increased apex height provides plenty of space for taller plants and working headroom, so you can spend many happy hours tending to your crops. This Evesham greenhouse is perfect for smaller gardens and allotments and comes with a 10 year anti rot guarantee. Review:The greenhouse is great, I am in the middle of painting it green, the colour is called “willow”. I will send you a picture in a few days, it looks better than the photo you use for advertising. Thank you for leaving the feedback today,. We take all feedback very seriously - good or bad. it is good that you are pleased with your greenhouse and look forward to seeing the pictures. Review:Looks really good once painted. Our Reply:Good morningThank you for taking the time to leave your feedback today. It is good to know that you are happy with your purchase. Review:Had bought a summerhouse few years ago which had been good this greenhouse not such good quality, but still not bad for the price. Our Reply:Good morning,I am glad to know that you are happy with the value for quality and thank you for taking the time to leave your honest feedback. It is good to know that you are pleased with your purchase. Thank you for leaving your feedback regarding your recent purchase. I am glad that you are happy with the product and hope that you have many happy 'growing times' in your new greenhouse. Review:Excellent product, we are very pleased with the final outcome! Review:I will send a photograph once painted. It is great to know that you are pleased with the quality of your greenhouse and an image would be lovely to see. Thank you for the offer and thank you again for your positive review. Thank you so much for taking the time to provide your kind and valuable feedback. We're pleased to know that you found your product to be good value for money and that your assembly was simple! Review:Perfect Greenhouse for the money. I painted it to make it my own, but it was very straightforward to put together, and the instructions are very easy to follow. Your greenhouse looks lovely! Great choice on colour. It makes the perfect addition to your garden. We're pleased to hear your assembly went well and you found the instructions easy to follow. We hope you enjoy using your Evesham Wooden Greenhouse! Review:For the money, I have no complaints. It went together easily, nothing was missing and the instructions were easy to follow. Great to hear your Evesham Wooden Greenhouse is good value for money and that you found our instructions easy to follow. 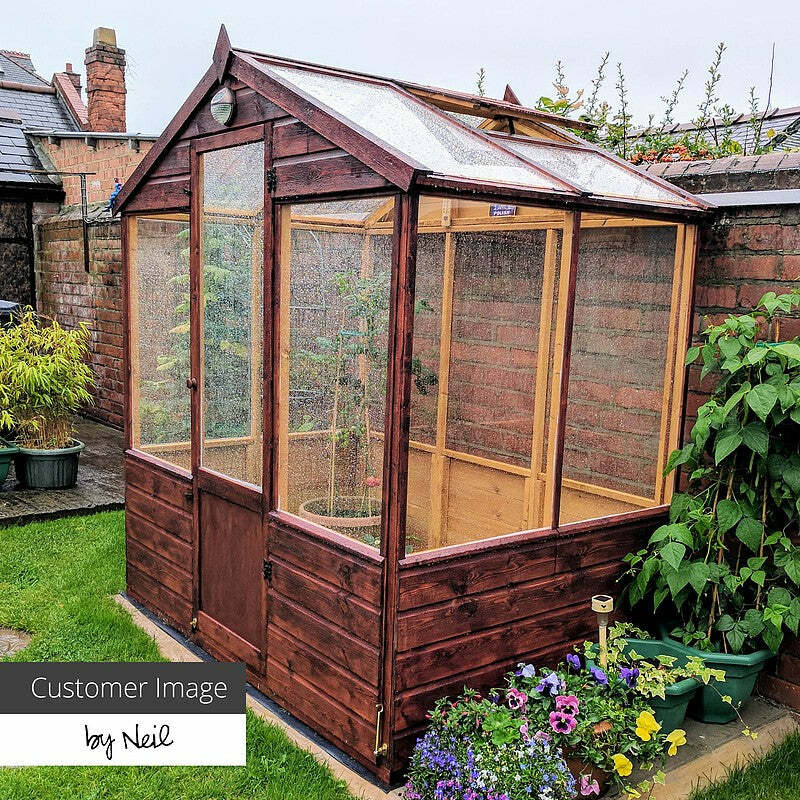 We're glad to hear your Evesham Wooden Greenhouse fits well in your garden! Review:Exactly what I wanted. Easy to erect, ideal size. Timber looks fine. Seems like good value for money. Will know more when it survives the next winter storm. We always aim to make our building easy to erect for our customers and I am glad that you found this to be the case. It is great to know that you are happy with the value for money of your greenhouse and I thank you again for your positive feedback. Thank you for providing an image of your greenhouse! Looks great, lovely choice of colour too! I am thrilled to know that you are so happy with the quality of your greenhouse and that you would recommend - this is much appreciated, as is your great feedback! Great to hear you are pleased with your greenhouse and hope you enjoy it for time to come. Review:Ok let's be honest from the start. This is a low price greenhouse so let's not compare it with something 3, 4 or 10 times the price, that would be silly and unreasonable. If you want a Ferrari don't buy a Ford Fiesta... you'll be disappointed. I am thrilled that you are so pleased with the quality and value for money of your greenhouse. Thank you again for your wonderful feedback. Review:Love my greenhouse and bistro set. The greenhouse is very quaint looking but has plenty of room for all your garden bits and shelves for planting. I am delighted to know that you are so pleased with you new greenhouse and I thank you for taking the time to offer your great feedback. Review:The greenhouse I bought was well made but the opening window on the roof needs a rethink, perhaps having the window on the side panel would be better. Review:Great greenhouse at a reasonable price. I am so pleased you are happy with the quality and value for money of your greenhouse. Thank you for the image, it looks lovely! Thank you again for your great review - we really appreciate it! I am very glad to know that you are happy with the appearance and value for money of your greenhouse. Thank you again for your great review - we really appreciate it. It is great to know you are happy with the delivery service and I am sure you will be very happy once these have both been erected. Thank you again for your positive feedback. Thank you very much for your brilliant feedback, I hope you enjoy your new Evesham Greenhouse for many years to come and thank you for your lovely image. Review:So far a very satisfactory product. Looking forward to growing lots this summer! I do have a small suggestion........A one inch square batten horizontally across the middle of he window panel would stop it flexing too much in the wind. An optional extra??? Thank you for taking my call earlier. Apologies again for the issue with the shed boots and I am glad we were able to offer a solution that left you satisfied. Thank you again for your feedback! It is great to know that you found your greenhouse to be of good value for money and you are pleased with the overall quality of your purchase and service we have provided. Thank you again for your great review! Review:All erected now, looks good. Review:The greenhouse is good for the price. A few bits too loose or tight - was this the installer or the product? Thank you for taking the time to speak with me and I am glad we were able to discuss your queries and offer a resolution that left you happy. Thank you again for your feedback! Our Reply:I am pleased that you are happy with your greenhouse and should you have any queries, please do not hesitate to contact us on 0800 029 1000 or service@waltons.co.uk. Thank you again for your positive review! Review:Good strong product.Perfect for the job. Our Reply:I am so pleased that you are happy with the greenhouse and we thank you once again for your great review! Review:I was not as pleased as I thought I would be with greenhouse. Our Reply:I tried calling earlier and left a voice message, which I hope you will be able to pick up later. I would like to discuss your purchase a little further and if you could call me back on 0800 029 1000 or via email at service@waltons.co.uk I will try to resolve any concerns you may have. Our Reply:I am glad that you are happy with your greenhouse and the good instructions meant assembly went well. Our Reply:It is great to know that you are delighted with your greenhouse and that assembly went well. Review:For the price is was O/K but a few split and damaged panels but not enough to worry about. Our Reply:I am happy to know that you are pleased with your greenhouse overall and should you have any queries about parts, please do not hesitate to contact us on 0800 029 1000 and we will gladly be of assistance. Our Reply:It is wonderful to know that you are happy with your greenhouse and feel your purchase is good value for money!